Here, Now, and Always is a major exhibition based on eight years of collaboration among Native American elders, artists, scholars, teachers, writers and museum professionals. 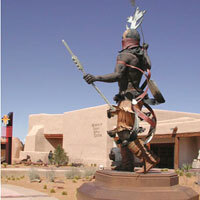 Voices of fifty Native Americans guide visitors through the Southwest's indigenous communities and their challenging landscapes. More than 1,300 artifacts from the Museum's collections are displayed accompanied by poetry, story, song and scholarly discussion.